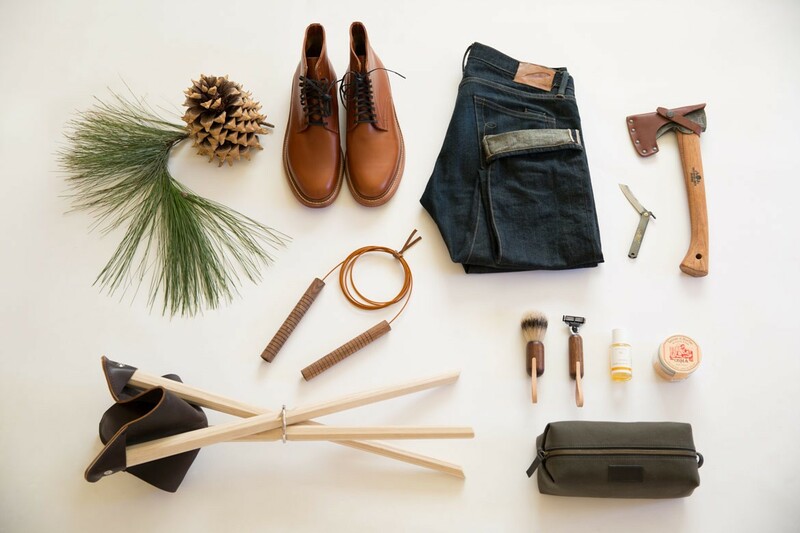 For our Men’s Gift Guide we have chosen a selection of items that are tools as much as they are objects of refinement. Each demonstrates integrity, skill and dedication to craft. The materials are honest and well-chosen. These are pieces that will be used everyday and whose craftsmanship ensures a lifetime of use. Featuring a silver-tipped badger knot, black walnut handles, and veg tan leather hanging loops, this set is handmade in Los Angeles from the highest quality materials. With its handmade wood and leather handles and nylon-coated steel cable, this jump rope is a serious piece of workout equipment that doesn’t sacrifice performance for style. Designed and made in Los Angeles. Our take on a classic tripod campaign stool, the new Coyote stool is made of solid domestic ash and available in a thick veg-tan or latigo leather. Designed and made in Los Angeles. Made from sturdy canvas and ripstop nylon, this classic dopp kit is sure to survive travel both near and far. Designed and made in Los Angeles. This unique French-made shaving soap combines shea butter and alum to moisturize the skin and prevent irritation. Made in Germany from all natural ingredients, this light day oil is great to apply after shaving to balance and moisturize the skin. Hand-forged by expert Swedish smiths, the Gränsfors axe is great for splitting logs for the fire, whether in the backcountry or the backyard. Once commonly carried by Japanese students to sharpen pencils, these hand-forged carbon steel pocket knives remain as useful as ever for a variety of household and outdoor tasks. All Oak Street shoes and boots are handcrafted in the USA by shoemakers with over 20 years of experience and constructed from renowned Horween Chromexcel leather. They are one of a small handful of companies making shoes the traditional way. Combining modern fit with classic denim construction, Rogue Territory jeans are made from Japanese selvedge denim and handcrafted in Los Angeles. Based in Los Angeles, California and in Germany, Kalon Studios is a design studio focused on contemporary form with a particular aesthetic of simple, subtle and unobtrusive beauty. Kalon Studios' design focus is as much on quality of design as it is on material, method and process. All of our products are non-toxic, fully sustainable, and domestically produced respectively in the in the US and in Europe. Each piece is handcrafted to order by traditional furniture makers. The ancient Greek concept of 'kalon' meant beauty linked with moral worth and usefulness, a value we seek to express in our designs.